Spend an extra $6.15 and get this item plus these 2 items with our Sport Helmet - 3 Piece Package. The pioneer in lightweight, all purpose, vented riding helmets, the Sport remains one of the most trusted helmets on the market. Its durable, lightweight construction offers seven vents, an attached visor, and a removable, washable headliner. All the basics, in your choice of black or white. The riding helmet was a perfect fit for my daughter. These are fabulous for the money. Work good in my lesson/camp program. I purchased two of these helmets for my grandchildren. I could not be more pleased with the quality. It fits my head well and is light weight. I received the Troxel Sport Schooling helmet and it appeared to be a quality budget helmet. However, the fitting guide on the Stateline Tack website is not accurate. Following the guide carefully, I ordered a large-size helmet, but it turned out to be way too big. The helmet does not include an adjustment knob on the back, and it was impossible to make it fit with the pads that were included. Stateline Tack emailed me a UPS return label so I could send the helmet back. I re-ordered, but instead of the Sport, I upgraded a few dollars to the Spirit, which has an adjustment knob. I also got it in medium instead of large. This is a very nice helmet. Unfortunately, the fitting guide on the Stateline web cannot be relied upon. I hope they will revise it. Great, I love and a great price also, the medium fit me perfect! Always good to have heading protection. Theses helmets fit snuggly and don't interfere with your line of sight. I thought I was purchasing gently used equipment so I was thrilled when a brand new, beautiful helmet arrived. Thank you so much!!! Great value for a quality helmet. My daughter loves it. It’s comfortable with no issues. Good helmet-hasn’t had to do its job yet. Great fit! My daughter was very comfortable in it. We have a riding group for underprivileged kids so I was happy to be able to buy some helmets at the sale price. The kids are happy to wear them, they are inexpensive and do a great job. 4 year old Charlee was the first to wear the XS Troxel at our 501C3 Ruby Riders group. Great price. Fit well. Sizing was spot on. Could ask for a better first helmet for my toddler! My daughter is a beginner in barrels and poles and I just want her to be safe. This helmet is so affordable but looks expensive! Great fit and so comfortable, I tried it on too. This is being given as a gift to our granddaughter who will be taking riding lessons in a couple of months. She will be so excited about this, and from what we've rresearched about Troxel brand equestrian helmets, it will be more than adequate to protect her from injury. I bought two helmets for my kids because they started riding recently. I specifically chose white so they could decorate them with sharpies, stickers, and rhinestones. They loved the idea and are happy to wear their helmets! Nice helmet but the sunshade (bill of the helmet) keeps popping off one of the two I ordered. I ordered two of these helmets. One for myself and one for my daughter. My daughters' helmet, the sun shade on the left side keeps popping off. I haven't had any issues with mine but I think we're going to have to Super Glue hers to keep it from popping off anymore. Overall I like the helmet just disappointed that her seems to have an issue. This is a present so hasn't been used as of yet, but it is the second one we have bought so far. I like the look, the price, & the fact it is white does not absorb sunlight like a black helmet. I have had many Troxel helmets. The Schooling Helmet is great for the p rice. This is my go-to helmet. I ride several days a week and replace my helmet every two years (or whenever I smack my head), and this helmet is affordable enough for me to do so. I'm old enough to remember when only the velvet show helmets were available. This one is a miracle of lightness and coolness by comparison. It's comfortable, the straps adjust easily, and I can just take the headliner out and wash it. I see other reviews that remark it runs a little small, and I agree. Couldn't pass up the sale price. Great extra helmet to have around for when the kids have a friend here to ride. I needed a new helmet for one of my Jr riders after he had a fall and his helmet got clipped by a hoof. I bought one for myself, husband and all my riders, these helmets are much cooler and more comfortable than previous helmets I have used in the past, without sacrificing quality and safety. I highly recommend Troxel helmets. This helmet has a nice liner for comfort and the size is accurate! I purchased this helmet a few months ago for my son, which is just beginning to ride. We had a situation with his horse where he took off after another horse and the reins broke and he had no control. Needless to say the horse threw him off and he hit his head pretty hard. Without this helmet and the design it is designed for my son would have had a totally different outlook according to the doctor in the ER. His helmet took the impact and broke into three pieces which took the impact off his head and kept him with just having a concussion.I am beyond thankful for the helmet on his head and troxel. I can't really give an adequate review, as this is a Christmas present for my niece. However I did look at it and pictured her in it and in my mind she looks great. Hopefully she will love it. Thank you. This helmet was bought for a small child who is just beginning to ride. The helmet was a great fit and is adjustable giving her more room to grow. This product surprised me on the quality. I took the time to measure my head around with a measuring tape to compare to the sizing chart. It fits but they run a little small. For advice for future buyers order one size up and you'll be fine! Otherwise, amazing buy and I'm very happy with my purchase. Just right for a novice trail rider. I ordered this product for trail rides in the mountains. It's fit, price and quality has met all of my expectations. Everything about the product, the purchase, the delivery and quality of this helmet and my shopping experience was excellent. This company is the epitome of what it means to provide an unequivocal shopping experience. Thanks to the helmet measuring guide I made a successful purchase - helmet was used the next day. It was a perfect fit. Thank you! Our local Gymkhana the kids must wear helmets, so I ordered this for my 2 1/2 year old granddaughter and she has gotten to run (trot) barrels now and she is so hooked, she wants to go faster. It fits her great stays up out of her face, and she likes wearing it so it is comfortable for her too. Bought this helmet for the children in my lesson program size small for my young ones and it is a great little helmet no cons. Great price. The 2 Troxel helmets have everything that was stated. Packed in their own individual boxes with the inserts for sizing them was an added feature that was appreciated.Though the children have not used them to ride, I do have each sized and fitted for each child.The helmets should give them years of protective wear. Love these helmets. Purchased for my 2 and 4 year old children. They love wearing their helmets. Very pleased with the size and quality. my daughter is 6 years old and is very petite for her age and I was searching everywhere for a helmet that would fit her properly and I finally found the statelinetack site and for the price cant beat the quality and fits perfectly thank you! I have bought several of these int the past and found them to be an excellent buy. I would like to buy a better helmet with a more solid outer shell, but they seem to grow legs and disappear, so these are quite adequate, all things considered. Have others. Great schooling helmet for my lesson and camp kids. Price is right. Needed an inexpensive small helmet for grandson. I have grandchildren that ride and i wanted a quality helmet for them to use. My daughter is advancing with her riding lessons and requires them at this time. This is the helmet our Equestrian teacher recommended. We're new to the sport. Thanks! I've used this brand before. Comfortable and breathable. Great helmets for my grandsons. My daughter's helmet is too small. Time for a larger size. Best price I found online. duh, to protect my head. I need my own instead of everyone's. I don't normally wear a helmet; however, I have started riding a colt. Thought it would be a good idea especially with a young horse. Bought this one due to low price. This was a gift. It was a godsend when the horse my daughter was riding threw her off and she hit her head! Daughter takes English Riding lessons and while she is 8 and growing, these helmets seem to stand test of time. For my Daughter who is learning to ride a horse. Began riding lessons with my children and would like a personal helmet. Great 1st helmet for hubby. This is what the school she has recommends. I bought this helmet for my special needs daughter who is 14 and gets horse riding therapy once a week. She has grown out of her current helmet and we liked the brand and price of this helmet. We haven't gotten it yet but hopefully it will be what we want and it will come in time for her next riding lesson. very good helmet for great buy! I am on Law enforcement mounted search and rescue unit and need helmet for training. The price was great and I've used it before. 4-H Requires this type of equine ridding helmet. Are these helmets ASTM/SEI Certified? BEST ANSWER: The Troxel website says that these are SEI Certified- not sure about ASTM. ARE THESE HELMETS FOR KIDS OR ADULTS? BEST ANSWER: For adults, although it depends on the size of your head. The straps are adjustable, and there are spongy inserts that come with it that can be put inside the helmet to make it fit snugger or looser. I am 5'10", but I have a pretty small head. My friends with teenagers have tried to borrow the helmet for their kids, but it's actually too small for them. I have the same helmet in a small and a medium. I wear the small in the summer. This allows heat to escape through the vent holes in the top and front. Helmets with a solid top and no vent holes are too hot for me in the middle of the summer. I wear the medium in the winter because it allows enough space to get a hood or a toboggan under it to keep my ears warm and still have the helmet protection. I absolutely love this particular helmet. The shape and contour are very comfortable for my head shape, so that it never gives me a headache after hours of wearing it like many helmets do. It's lightweight, and I barely even notice having it on. It's also the most durable helmet I've ever had in this price range. I do mostly mountain trail riding, and my helmets get used and abused HARD. None of the snaps have ever broken, the joints have never separated, and the bill has never cracked. I had my first one for about six years and took several hard falls and many tree limbs in the face without it breaking. My horse shied hard at a full gallop one day, and the saddle girth had gotten too loose. The saddle slid sideways and I flew off and landed head first on a big rock. The rock broke out the back of the helmet where it took the brunt of the impact, but it completely protected me from what would likely have been a deadly accident. I was already very happy with the helmet, but that sealed it for me. I have never used any helmet but this one since. For the price, you can't get better, more comfortable protection, and the durability is excellent in my experience. This helmet is not specific for children or adults. It will work for either, dependent upon the rider's head size. I bought these for my kids. They would be too small for an adult. We love them! My head is 22 1/2 in. What size is that? BEST ANSWER: I bought a small for a 21-1/2 head size. It fit perfectly. I would suggest you get a medium for the 22-1/2 inch size. sorry it took so long to answer but I couldn't remember what size I bought for my granddaughter so had to wait until I could find out from her. I don't know the inches but the helmet is very small. It fits most of my pony ride kids and some first graders. Troxel sizing information is available on their website, google it for the link (not allowed to post it here). I checked several sizing charts and I believe you would want a medium. If the childs head is 21 and 1/2 inches in circumference what size should I order? A head that measures 21.5" usually takes a helmet size 6 7/8. According to the troxel website that measurement is in the "small" range, it doesn't look they have "kids" sizes other than an XS- youth head size is close to adult, so that makes sense. Please check out the info on their site for fitting tips, too. how good are these helmets? BEST ANSWER: Troxel Sport Schooling Helmets are a great value. Their safely rating has been as good or better than other brands. I have a children's riding program, and use several of these. They look nice and are easy to clean. I have had other more expensive helmets for myself and when it was time to replace them, I went back to the basic Troxel Sport Schooling Helmet. I also have a couple of the next level of Troxel helmets which have the dial fit system. There is a dial at the back of the helmet to help adjust the fit. It helps to quickly change the fit when the helmet is being used by more than one person. In my experience, for people with a small head, it creates a better fit. I'm pleased with them. I have used several over the past decade, replacing each time I suffer a fall. They fit true to size and are cool and lightweight. I even hit my head on a railroad tie once while wearing one and avoided suffering a concussion. Although this is not a guarantee that the same would happen again, I trust the product enough that I bought one for my daughter when she got her first pony. For winter riding, you need to wear a silk stocking hat underneath to keep your head warm- anything heavier may mess up the safety harness fit. The quality of construction seems quite good and it fits the young girl very well that we bought it for. Thankfully, she has not fallen so it has not been thoroughly tested in a significant impact. These are excellent helmets for safety and fairly good on looks too. We have used them for years at our ranch. They hold up well although the visors tend to pop off with as many kids as we have use them. I would think with a single user they would last better. Very nice helmet comfortable, lightweight, but sturdy. I also bought the cover that goes over for winter (live in the Sierras) and it is great and warm. Good value for the money but do not fit all heads well. Be sure to check fit. They are great. Mine fits well and is comfortable. I would buy it again. how do you size a helmet? BEST ANSWER: Measure around the crown of your head so put the beginning of the tape in the middle of your forehead, wrap around the back of the head and bring the measuring tape back to the front of your forehead where you started. It is easiest to have someone else do the measuring. Helmet sizes vary so there should be a chart that is associated with the brand of helmet you are looking for. Does that help? Take a soft (sewing) measuring tape and measure around your head above the ears and just above your eyebrows. This will give you how many inches around your head is. For example if your head is 22" around you will need a size small Troxel helmet. If your 24" then you would need a size large. Here is a link to their fitting website. I bought a Troxel Helmet for my granddaughter, to use for her horse riding lessons. I actually went to a store, tried them on her for the correct fit, then went home and ordered it online. She loves it! I was told to get a small, to size the helmet i am not really sure to be honest. Does this fit a 2.5 year old? BEST ANSWER: It depends on the circumference of the child's head as sizes vary among the same age range. This helmet is not adjustable for size like some of the other helmets are. We use this helmet for some 2 1/2 year-olds and for others up to age 8 or 9, depending on their size. 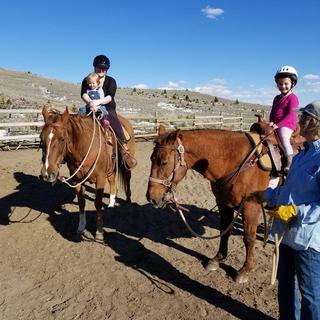 We use it mostly for our "Little Buckaroos" riders, age 5 to 7, but, again there is a wide variance in sizes by age. You would have to measure to know for sure. The XS fits up to 20 3/4 inches. To measure, use a tailor's measuring tape and measure around the head above the ears and just above the eyebrows. I hope this is helpful. For more info on the helmets, you can check the Troxel helmet website. my childs head is 21 inches. There is a lot of padding. I use this helmet on 2 year old when walking them around. Is this a youth helmet? BEST ANSWER: No, itâ€™s not a youth helmet. I measured my head and ordered the appropriate size for me. It can be used for either youth or adult. App. If order how long will it take to get it? BEST ANSWER: It depends on the delivery location and ship method chosen. In-stock items are usually received in 4 to 10 business days. It depends on which shipping method you choose, but my orders always show up within 7 days if everything is in stock. I usually get my order in a couple of days, they are pretty speedy. Does this model have the dial adjustment in back? A review suggested yes, but the description was unclear. Thank you. BEST ANSWER: No, the troxel Spirit is the one with the dial adjustment, item SLT722636. Could you give me the interior measurements of xs helmets?. We have several helmets and we don't want to buy additional same size helmets. I don't have head size measurements because I am teaching multiple children. BEST ANSWER: The extra small will fit a head up to 20 1/2 inches in circumference. If you need something adjustable, the Troxel Spirit Schooling Helmet can fit 20 1/2 inches up to 22 inches. made for 4-7 year old kids. My 8 year old fits into a small. i have a 21 1/4 size head. what helmet size would that be? BEST ANSWER: You would probably have a small. You can look up the troxel sizing chart online. A small is for 21-21.5 size heads. My head measures 21 inches & I wear a small in any helmet. The adjustable band helps to make a good fit. Would size large fit 7 1/4 head? BEST ANSWER: I bought a selection for my lesson barn, but I have a 7!/2 head and believe that large would be adequate for 7 1/4. Yes. Large is for 7 1/4+ sizes. BEST ANSWER: Yes. It's white with black brim, trim, & straps just as shown. Is this a kids helmet? BEST ANSWER: No, but it may be suitable depending on the child's head size. How many inches is the small and medium around? What is the size of the large one I have one that is mine is 6 1/4 -63/4? BEST ANSWER: The sizes are XS (up to 6 5/8), SM (6 3/4- 6 7/8), MD (7- 7 1/8), and L (7 1/4+). BEST ANSWER: Removable, washable headliner. what size for 21 inches? BEST ANSWER: 21"= 6 3/4" helmet size, which would equate to a size small. how do i know if i'm a s,m,l...my hat size is 6 7/8? BEST ANSWER: Hello, please use the below link to access the sizing chart.